Art has the capacity to evoke a range of emotions from the viewer, whether it be religious fervour, nostalgia, romance or even horror. 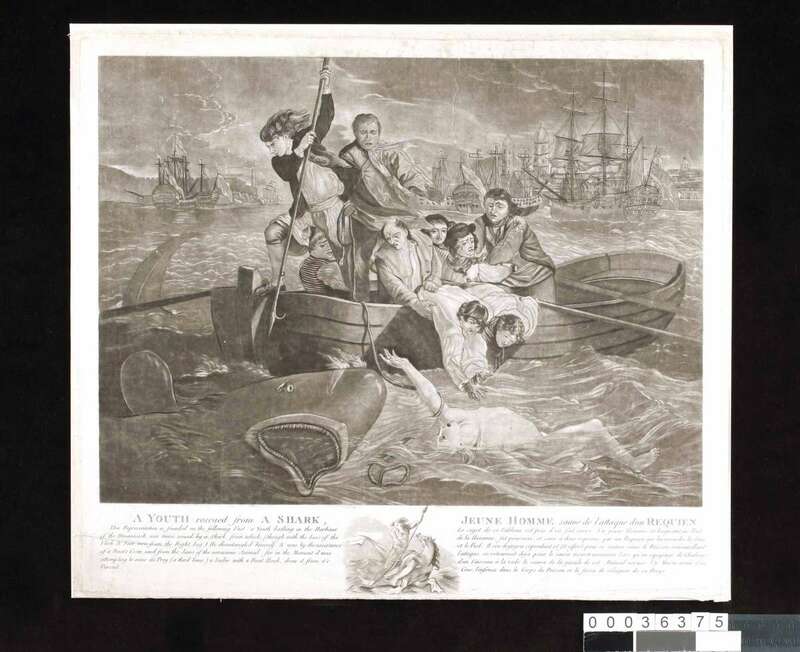 Valentine Green’s engraving, Youth rescued from a Shark (1779), is designed to portray what was seen as, and to a large extent is still considered, one of the most feared aspects of the ocean – a shark attack. In 1749, the fourteen-year-old English sailor, Brook Watson, was swimming in Havana Harbour, Cuba when he was attacked by a shark. Watson had been serving on board an American merchant ship before he decided to take that fateful swim. His shipmates spotted him struggling against the shark and rowed to his aid. Watson managed to disentangle himself; however the shark had severed his right foot at the ankle and he later had his leg amputated just below the knee. Worlds away from the shark attack these cutting remarks were attacks of a different kind, designed to thwart Watson’s political ambitions. What it demonstrates, however, is how Watson’s public persona became synonymous with the terrifying tale of his struggle against the shark. The fact that the painting was reproduced in this engraving also lends itself to this idea, as it would have been printed and distributed for buyers interested in obtaining a copy of it. Below the engraving is a small blurb in English and French detailing the ‘Loss of the Flesh & Foot, torn from the Right Leg’ and Watson being ‘sav’d from the Jaws of the voracious Animal’.